Personnel - Mayu Saeki: flute, piccolo, shinobue; Aaron Goldberg: piano; Nori Ochai: piano; Joe Sanders: bass; John Davis: drums. 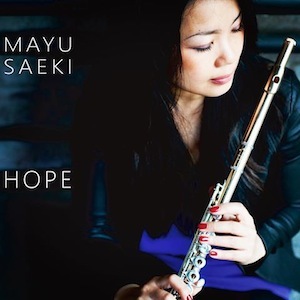 On her debut album, Hope, Japanese flutist Mayu Saeki sonically documents the adventurous journey that took her from her native Tokyo to New York City, where she is currently based. A former protégé of the celebrated drummer Chico Hamilton, who welcomed her into his group, Saeki reveals to have an independent voice both in the composition process and performance of her music. In addition to premiering three originals, she arranged two of the most emblematic tunes by Astor Piazzolla, where her classical training is most noticeable, and another one by Ryuichi Hattori. Joining her here are performers of undeniable quality like pianists Aaron Goldberg and Nori Ochai, who play three songs each, bassist Joe Sanders, and drummer John Davis. “Dilemma” unbolts the door with a killer bass groove that is simultaneously sturdy and courteous. Having Goldberg at the piano, the solos succeed one to another, encompassing every member of the band, while the sweet-natured melody translates into an efficacious storytelling. Goldberg also joins for the title track, a 3/4 tone poem gently propelled by a relaxed bass conduction and brushed drums, and Hattori’s “Soshu-Yakyoku”, an untied ballad lift up by a dreamlike aura and iridescent colors. While soloing, the pianist funnels his alluring ideas into the body of the songs with breathableness, preciseness, and focus. The malleability of Sanders, who accurately sings his magnetic improvisations, and the bandleader, whose roots are not neglected during the exploration of sensitive melodic lines, are also eminent. If the shinobue, a high-pitched Japanese transverse flute, enlightened the latter piece, the piccolo, a half-size flute, was the right instrument to dig Piazzola’s Advancing through a triple-time cadence, “Oblivion” is a lovely tango introduced by Ochai’s piano and assembled with a tearful tonal decorum and unburdening chord changes. “Libertango”, another famous tune by the Argentine composer, was proudly arranged with an introductory section of flute and tambourine, having arco bass and flute operating in unison. Sanders and Saeki also aurify the improvisational section. Descendant movements on the electric bass combine with cymbal accents and hi-hat marks to better guide the closing piece, “Do You Know..?”, which tilts toward a seductive Latin flux that holds Saeki’s candid solo. Both the musical choices and the stainless nature of Saeki’s music-making, allow us to think of Toots Thielemans' line of work. Even leaning on an affectionate post-bop that mostly professes melodic and harmonic neatness, the music of Mayu Saeki still bears some adventure, brandishing the stamp of transparency.